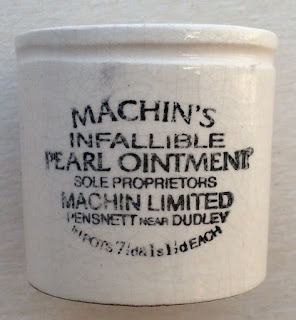 This page shows the 'Machin's' pots originating from the Birmingham area. 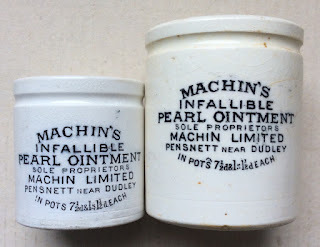 Pensnett which is the address appearing on some of the pots. 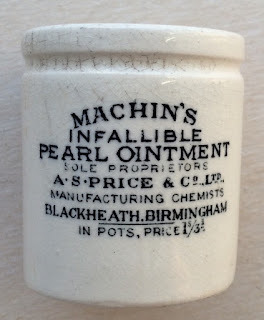 An Emilly Machin was listed at the same address in 1896 as a druggist. 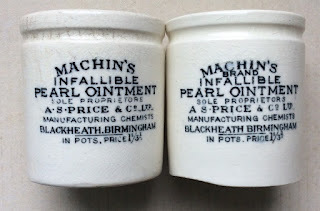 Two sizes of pots exist, the smaller one bearing a price of 7½d and a larger pot priced at 1s 1½d. 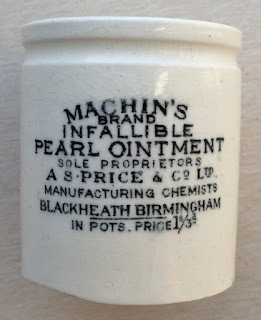 In 1908 the chemist business of Emily Machin was taken over by a company named A.S. Price & Co Ltd who traded from the High Street, Blackheath address in Birmingham. 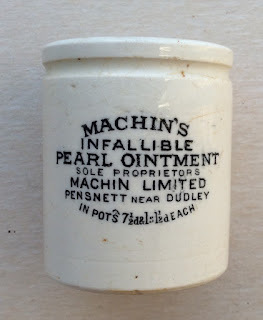 A higher price is recorded on the 'Price' pot of 1/3d and there is a variation that exists that has the word 'BRAND' below the company trading name of Machin's. 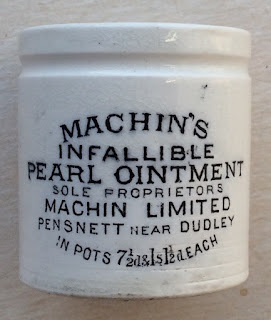 An A.S. Price pot was dug in 2005 at Dudley as refered to in a small article published in ABC magazine 23. This variation without the word BRAND. This variation has the word BRAND. Further information regarding these pots can be obtained from the Historical Guide to Delftware and Victorian Ointment Pots book produced by Messrs. Houghton & Priestley, pages 102 & 103.